I haven't been exploring new indie brands lately, mainly to keep my lemmings to a minimum and keep my budget under control. This rule was broken once I laid eyes on Pipe Dreams Polish, a new indie on market that promises explosions of color that is perfect for summer. The first of this line that I have for you is Pink Elephants And Lemonade, a fun combination of pink and yellow hex glitters in a muted teal crelly base. I used two easy coats for this mani and had no difficulty whatsoever with the formula or application. It glided on smoothly with no clumping of glitter and only needed one layer of Essence Gel Look topcoat to add smoothness and shine. 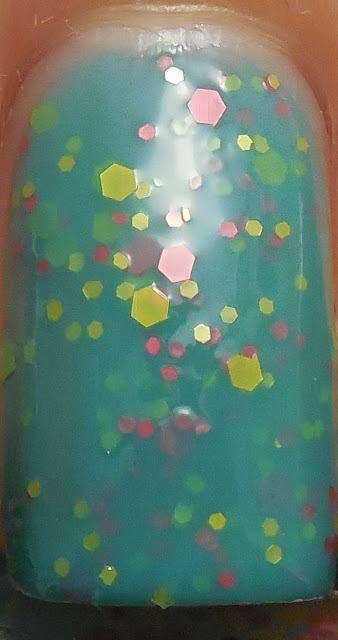 The 2nd polish I tried from Pipe Dreams is a glitter topper called Like, Totally, which is the perfect name for matte neon square and hex glitters in pink, teal, white and gold. Application was disappointing - it's one of those nightmare formulas that are too thick. As a result, the glitters don't spread or flow evenly onto the nail and clump and bald in patches. Phooey. I had to dab some of it on to cover up the bald spots, and then work the clumped up areas to thin them up. This is finished with a thick layer of Poshe to smooth out the unevenness of the application. Overall, I really liked the glitter in the colored base, Pink Elephants And Pink Lemonade, but the clear glitter topper for me is a fail. I probably wouldn't purchase it knowing how it applies, but now that I have it, I see potential for nail art. I didn't like a full mani of the glitter, but on my other hand I used Like, Totally as a gradient on the tips which makes it less of a glitter bomb. Pipe Dreams has other glitters in colored bases that look really dreamy, and next time I'm in the mood to break my indie budget, I'd be happy to add some more of them to my collection. You can find her on Etsy here. ETA: I've been contacted by the creator of Pipe Dream Polish and she recommends using thinner in the base of Like, Totally to make application easier. 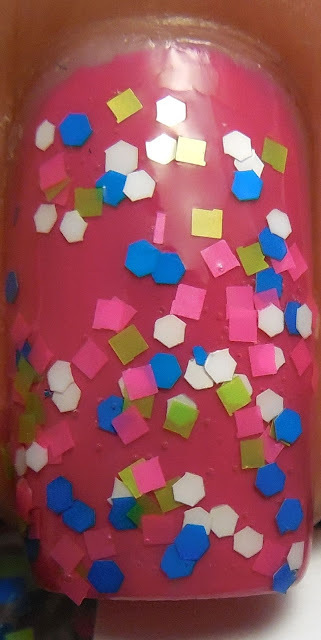 She sent me another topper, Moving Sidewalks, that has a much better formula and application, so she may have reformulated Like, Totally to apply similarly. And if your curious about the pink base color for Like, Totally, it's Spoiled Fuzzy Dice, a creme that I picked up from the last CVS clearance sale. 49 cents baby! Application was pretty decent considering the cheap price and large paddle brush. The formula wasn't too thick and was opaque at two coats with minimal streaking. I hadn't tried this brand before and I was surprisingly pleased with the result. However, due my clumsiness handling larger brushes I probably won't purchase any unless it's on sale. Hi Thithi, it's April from pipe dream polish. I sent you a message on etsy regarding like, totally. Hate that you had problems with it. Please check you etsy message from me when you get a minute...thanks!